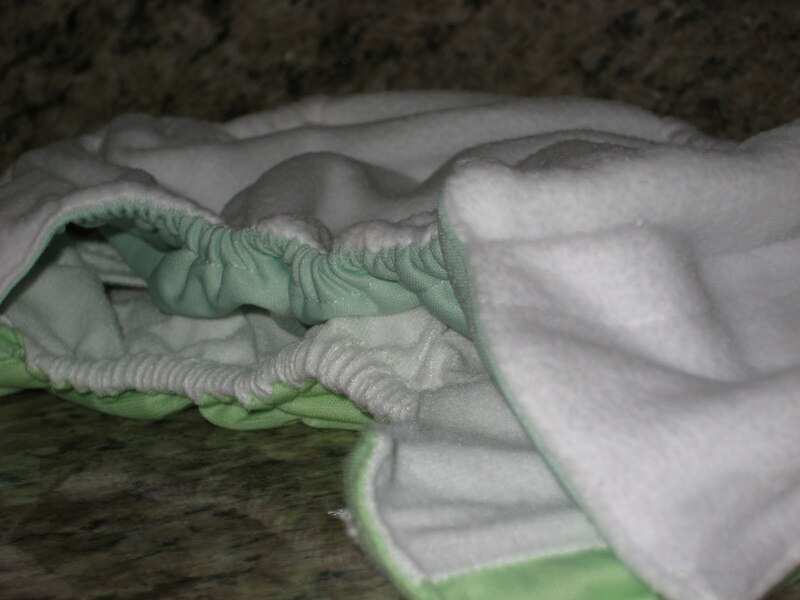 Before I begin, I have to thank my lovely reader, Jill, for introducing me to Katydid Cloth Diapers! 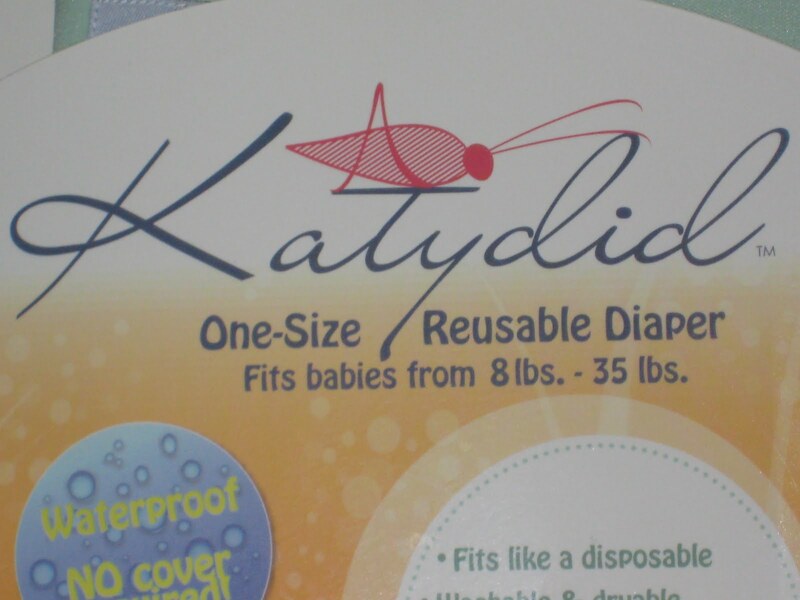 I contacted the company after Jill mentioned Katydid as a diaper she’d love to see me review/give away. Katie responded to me right away, and my review diaper came in the mail in just a few days! 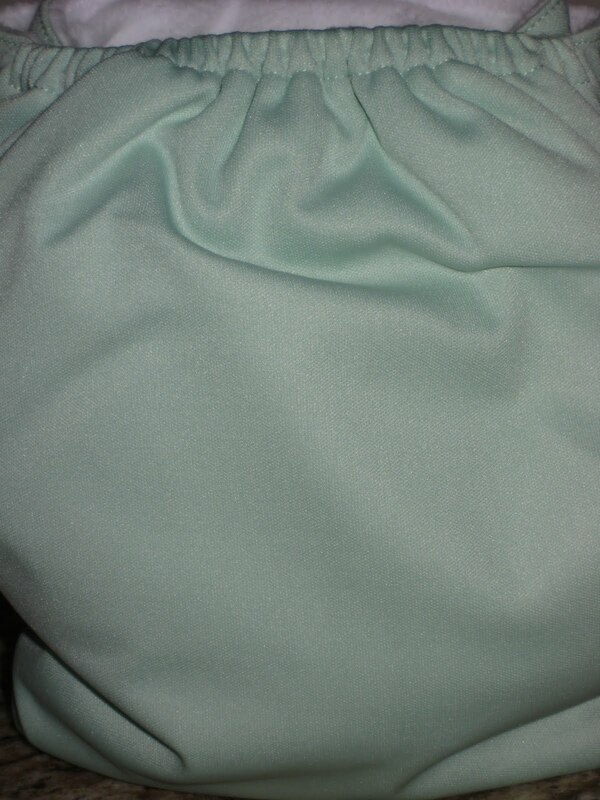 Katydid Cloth had all the makings of a favorite diaper for me right off the bat. Their diapers are one size pocket diapers with a snap down rise and snap closures, and they include a microfiber insert and doubler. 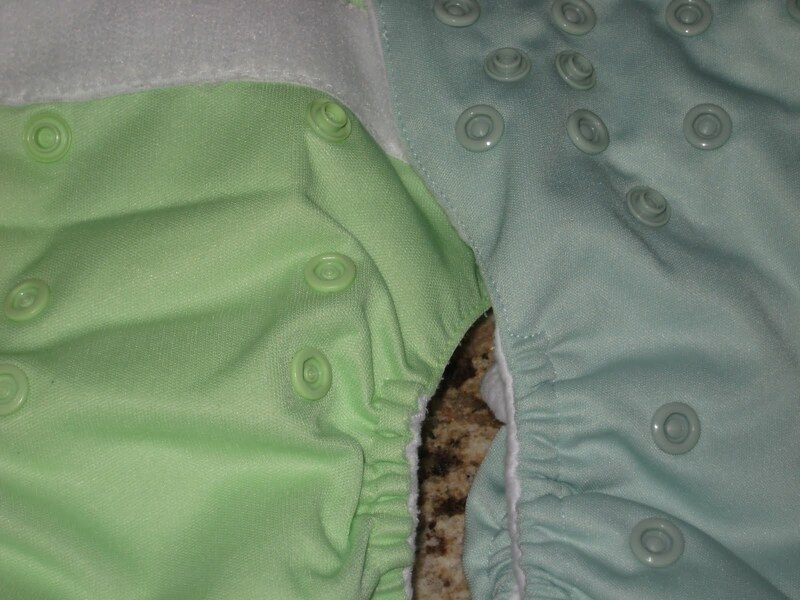 Right now, the diapers are available in berry, sage, melon and twilight, but more colors are coming! I love the twilight color! There are a couple of things that make Katydid special. One is the front pocket opening. With this, you don’t have to reach through an icky mess to pull out the insert. 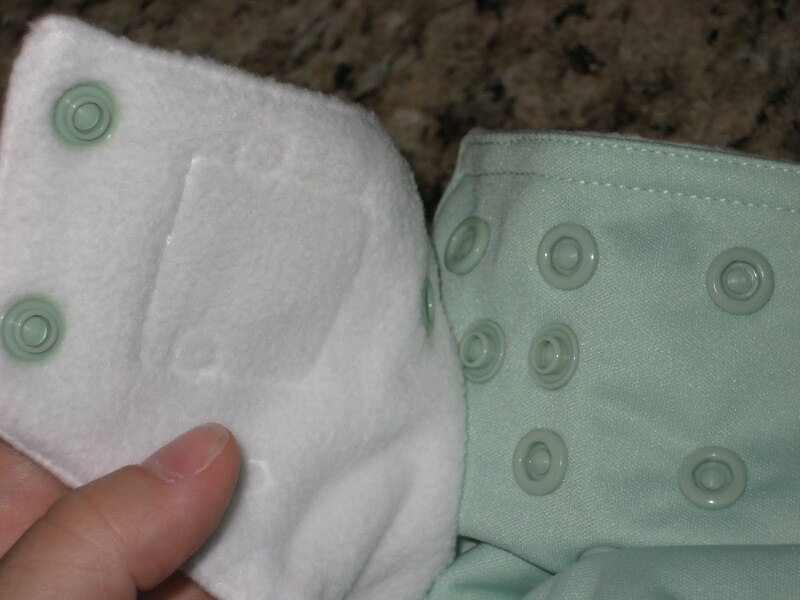 The snap overlap allows you to easily roll the diaper up and take it with you, if you find yourself with a dirty diaper and no wet bag. This actually just happened to me last week! Katydid calls this the “wrap & snap” feature. 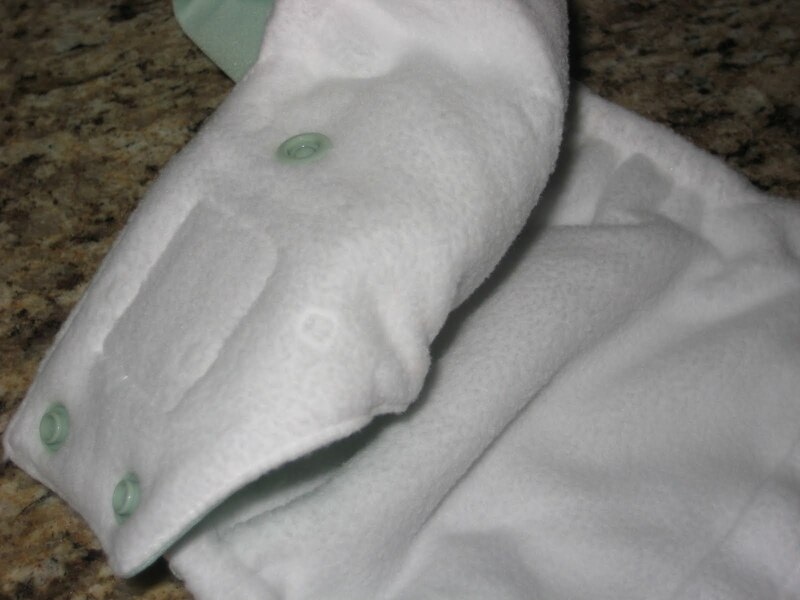 The microfleece inner is so soft. Oh my. 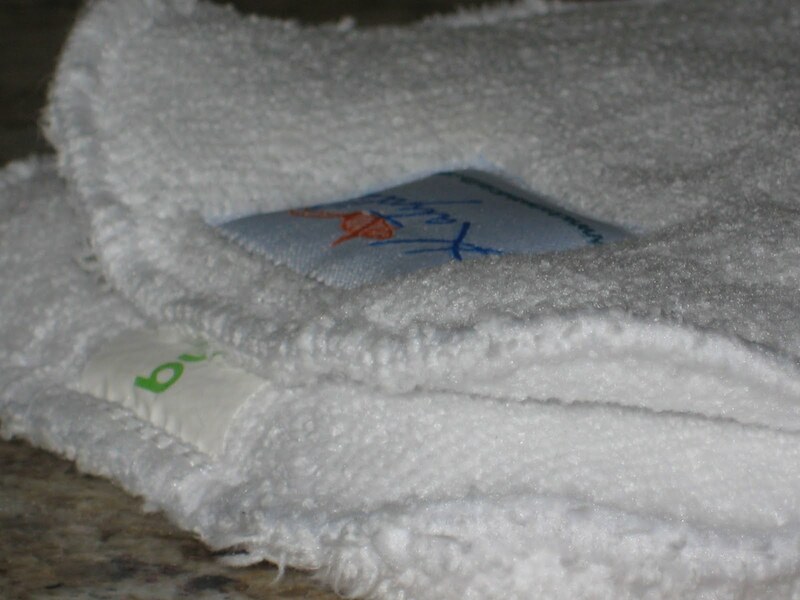 None of my other diapers are this soft. I would think it would lose some of the softness with repeated washings, but I do not recall any of my diapers being this soft when new. I want a pillow (or some undies, hee hee!) made out of this!! If your baby is small enough to need these, simply snap them first. Then, finish snapping the wings. The “hip snap” is female, not male, so it shouldn’t dig into your baby’s skin when s/he is big enough not to have it snapped anymore. For those that aren’t familiar with “wing droop” on newborns, I’ve asked my lovely assistant, Manny Bear, to demonstrate. Manny’s day job is bear lumberjack, so I’ve cut his head out of the pictures, to protect his privacy. He said he was afraid the other stuffed animals would make fun of him if they found out he was moonlighting as a diaper model. As you can see, on a tiny baby (or bear), the diaper snaps very close to the middle, and the wings are left flapping in the breeze. If I use the newborn side snaps, I get a great fit, with no wing droop. If I can get a good fit on fuzzy bear legs, I’m pretty sure I could get a good fit on newborn chicken legs too! I mean that figuratively of course. I’m not going to try to diaper a chicken. So how does it measure up? It sure does get teeny tiny. The medium setting seems just about the same as the medium setting of a Bumgenius 3.0. I noticed that the rise snap layout looked ever so slightly different. 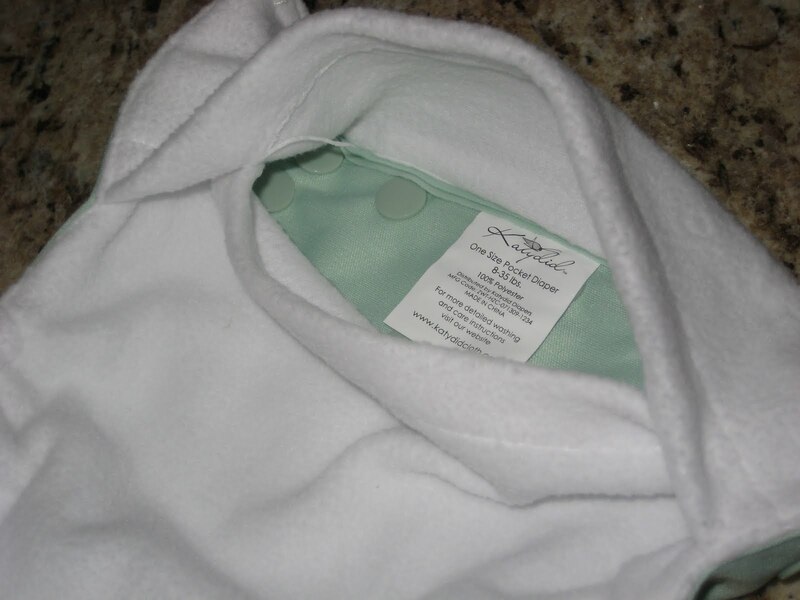 They have the same adjustable size microfiber insert, along with a newborn insert/doubler. I greatly prefer this snap down insert adjustment, since it saves a step and takes the guesswork out of diaper stuffing! Overall, the Katydid insert is just a smidge smaller. It also has two snaps to adjust the size of the insert, which allows it to lay flatter. 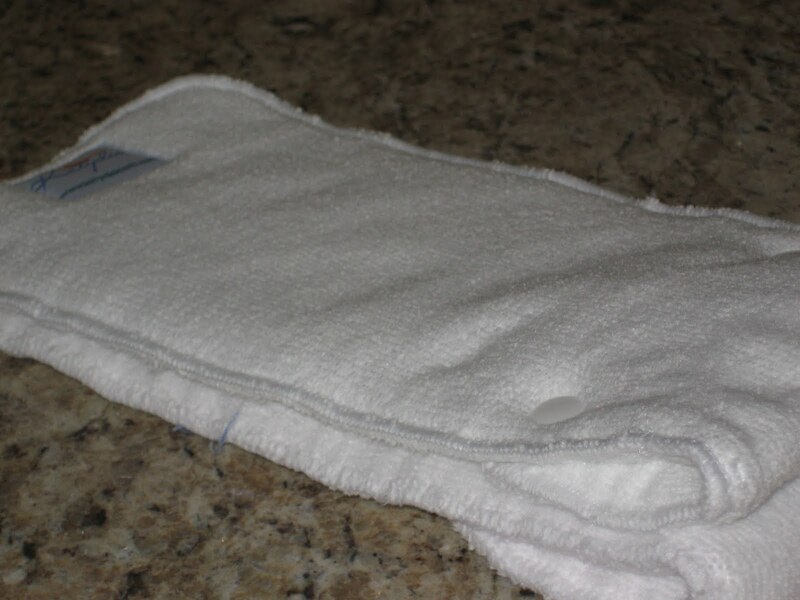 Finally, I measured the diaper on the small, medium and large settings, both folded in half, and fully stretched. 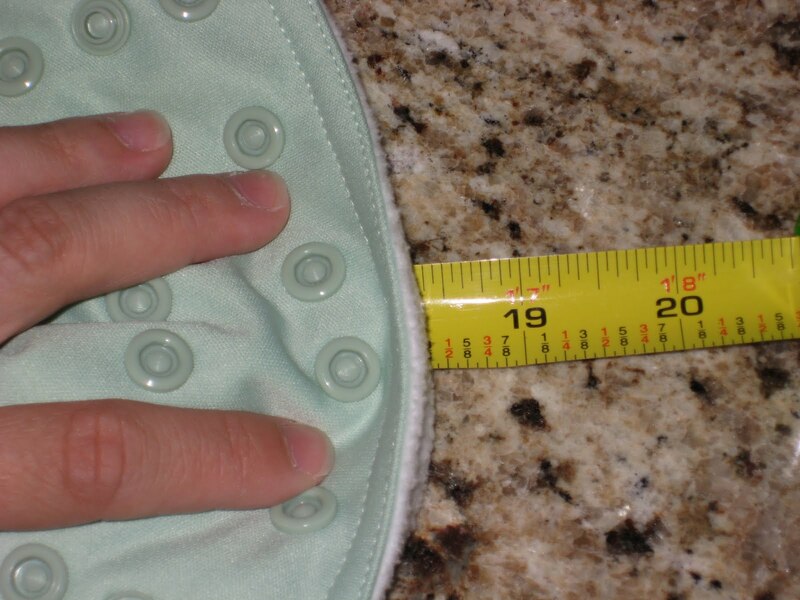 For comparison, I measured a Bumgenius 3.0 on small & large settings in this post. 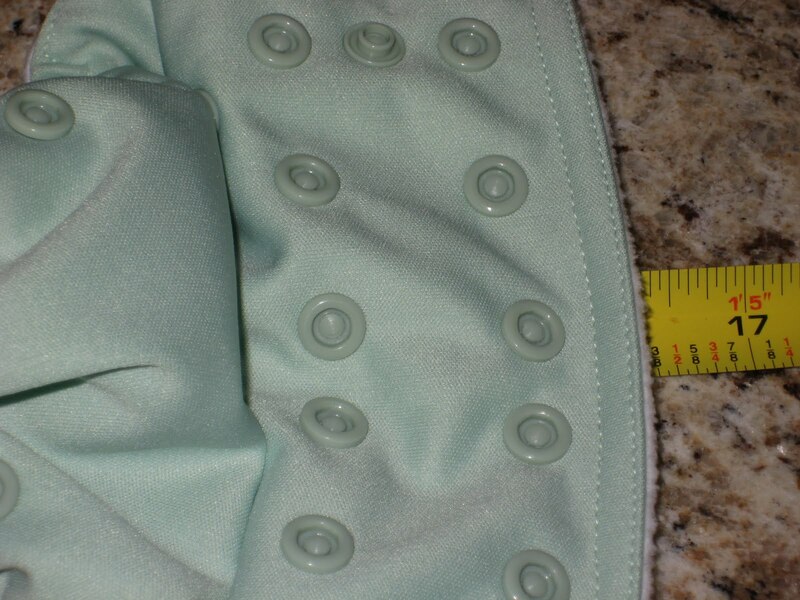 It seems to be a bit smaller than the Bumgenius, and the small setting seems much more likely to fit a tiny baby. The Katydid Cloth diaper is estimated to fit babies 8-35 lbs, but that of course can vary greatly based on your baby’s shape! My son is rather petite at 17.5 lbs and 28.5″ or so at 13 months. He fit in the medium setting, with plenty of room to grow. The back of the diaper doesn’t sit quite right. I wonder if it’s because I used the side snaps. Looking at this picture, it seems that’s what caused it. I really don’t need the side snap at my son’s size, but it didn’t affect the diaper. 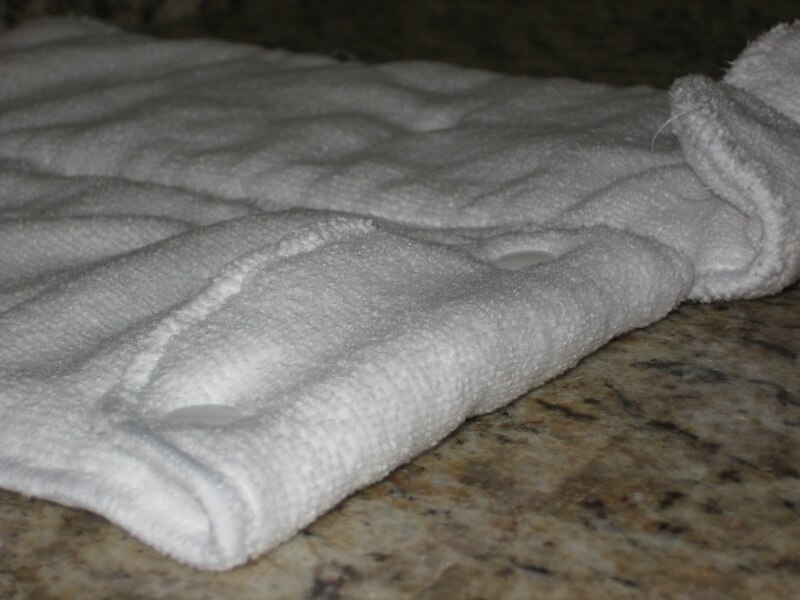 We still used it as our first in the morning diaper, with no leaks! At $17.95 each, Katydid Cloth diapers are priced wonderfully for a one-size diaper. 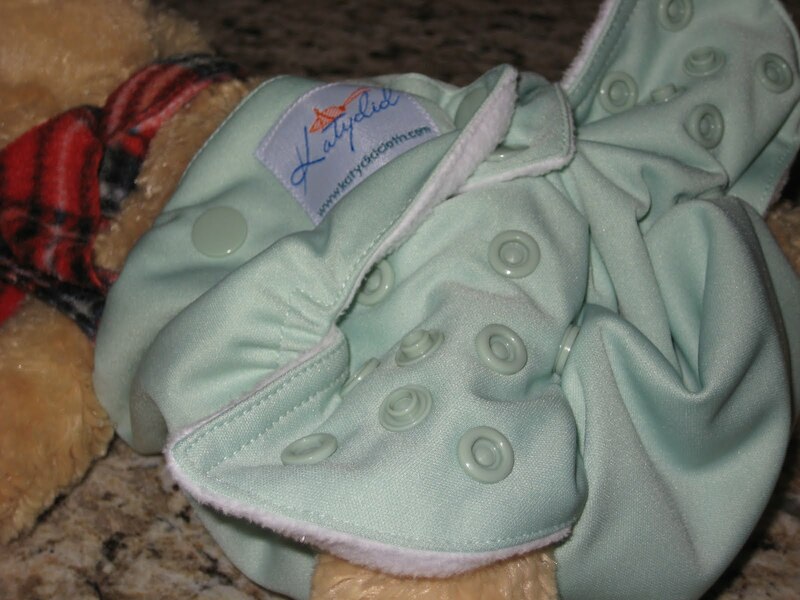 Editor’s note: Katydid Cloth has been renamed Oh Katy.See this diaper on my newborn. Want one? Shop for them or win one! 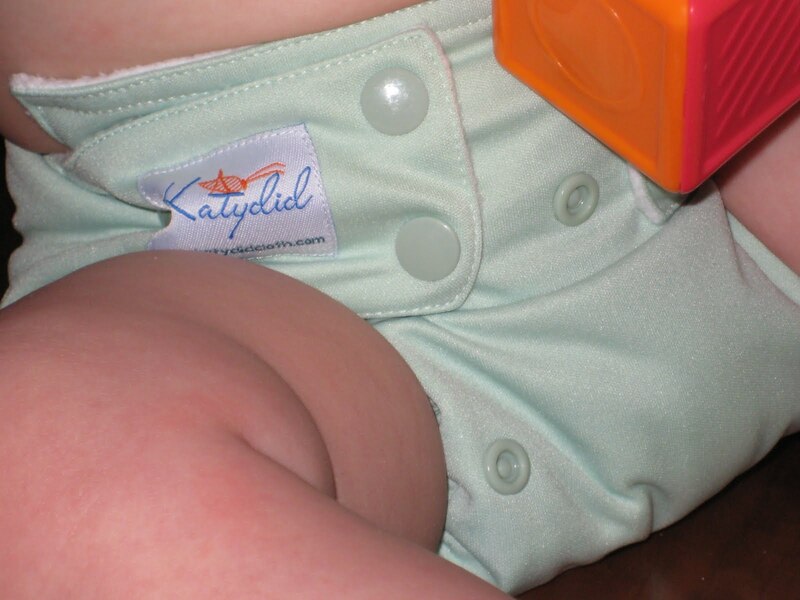 Katydid is sending one blog reader a one-size pocket diaper in his/her choice of color! Here’s how to enter: You may do any or all of the below. Leave a separate comment for each entry. Be sure the leave your email address in at least one of your comments if it isn’t visible in your profile. 1. Visit Katydid Cloth and comment with which color is your favorite. 7. Follow Katydid on Twitter. I will accept entries until Monday, July 12th, 2010 at 9 P.M. Eastern. Open to the U.S. only. Winner will be chosen using random.org’s true random number generator and will be notified by email. Winner will have 48 hours to respond. 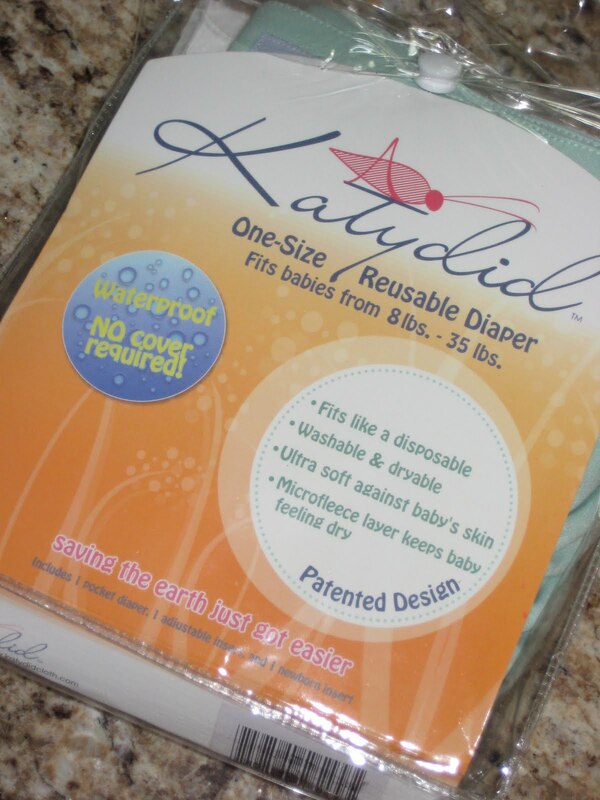 Thank you to Katydid for providing the awesome review diaper as well as the giveaway winner’s diaper. Their generosity in no way affected my review. I was not requested or required to write a positive review. They changed their name from Katydid to Oh Katy. I will update my links. Thanks! >I like Katydid on FB! >I like the orange the best! >i love the TWILIGHT color! >I'd love the sage color.taxchyk (at) gmail (dot) com. >Already following you on Twitter. >Already "Like" you on FB! >I follow you on Twitter @mileerom. >My favorite color is melon. >I likw the melon. What a fun color! >like katydid on facebook too! >Follow Katydid's blog now too! >Berry, since we just found out we are having another girl! >I now follow Katydid's blog! >My favorite color is twilight! >I liked katydid on facebook! >So many options, this could make your head spin!! >AND I "like" Katydid on Facebook! >My favorite Katydid diaper color is the Melon! >I follow Katydid on Twitter. >I follow Katydid on facebook. >That mandarin orange one is a great shade! >I just "liked" them on facebook. >I like Katydid on FB. >I now follow Katydid's blog. >I follow katydids blog too! >I like the berry. I was the one who suggested it, so I could not possibly pass by without entering this giveaway! >I love the twilight color even though I have a girl it is a beautiful blue! >I like the berry color the best! >My favorite color is twilight. >I liked Katydid Diapers on facebook. >I liked you on facebook. >With 2 girls I love the berry!! >I love the one Katydid Diaper that we have, i need more for sure! I love the Twilight color! >I like katydid cloth on facebook! >I like Katydid Cloth on Facebook. >I followed the Katydid blog. >I love the twilight and berry colors. I just bought my first pocket diapers yesterday,I'm getting adventurous now! >I follow the Katydid blog! >I like the twilight color! >I like the melon color the best. >I like twilight color the best! >I like the Twilight color. >Ooooh, I like the melon. >I think I'd love to own the Melon Katydid! >I like Katydid on Facebook. >My favorite color is the melon. >I like the berry and the twilight colors best! >. Follow Katydid on Twitter. >. Follow you on Twitter. >I just bought my first Katydid diapers in melon and berry, so I'd have to say that Sage is my next favorite! >The melon color looks yummy! >I am now a blog follower! >I "like" Katydid on facebook! >twilight is my favorite color!